There comes a time when one must gather up all the news-making developments from the glittery worlds of junior and senior song contests and collate them into one big, fat bulletin. That is, if one wishes to stay on top of things in any way, shape or form, as I do. Therefore, I have done exactly that for what will hopefully be your reading pleasure. I promise what’s ahead isn’t half as pompous as this introduction. JESC – it’s (probably) happening! It appears that Junior is no longer in jeopardy thanks to three more countries – including two debutants – stepping up and saving the day (as well as many of us from plummeting down to the depths of despair. Phew! After a short period of uncertainty – i.e. musings of ‘will they, won’t they?’ usually reserved for Slovakia in big Eurovision and/or the sexual tension-filled relationships of soapie characters – Moldova have confirmed their participation. I can’t help wondering if they waited just to get back at Russia for stealing Lerika, and as we speak are planning on kidnapping Katya Ryabova and forcing her to represent them as further revenge. Stranger things have happened. Whatever the situation, Moldova’s confirmation took the total of competitors up to 9, which was promising but not quite enough to ensure the contest would go ahead. Thankfully, and in a surprising turn of events, Albania and Israel both decided that they too will be shoving gussied-up children on to the stage in Amsterdam, which is very exciting news for two reasons. First, because there are now enough countries to make putting on the show worthwhile, and to use the current point allocation system. Second, because I just love the thought of a mini Rona Nishliu or Dana International, even though I know that’s not how the selection process works. Can you imagine Russia trying to find pint-sized Babushkis? As a result of the above, Albania, Armenia, Belarus, Belgium, Georgia, Israel, Moldova, the Netherlands, Russia, Sweden and Ukraine will be at Junior, with several countries still fence-sitting. Serbia are still pondering over whether a year’s vacation was long enough (FYI, it was, so come back!) whilst Azerbaijan and Italy have expressed interest in making their debuts – coincidentally the same kind of interest they expressed last year, which obviously amounted to nothing. But at least there’s hope for one or two more confirmations. On the ‘no hope whatsoever’ front, Bulgaria, Latvia and Lithuania are still out, gosh darn them, as is Macedonia. It was evidently decided that the risk of their artist’s voice breaking during JESC week was not one they were willing to take again. I say they should forget about that and just send a song that includes yodeling, and that way nobody will be able to tell. Besides, yodeling is an ancient Macedonian tradition, is it not? I swear I remember learning that at school. Decision time is imminent for Albania, Belarus and Georgia (who have already selected their artist – the group Shesanishnavi Otkheuli. All I know about them is that they are hard to type and even harder to pronounce) who will all pick entries in September. The national finals for Belgium and the host country – I’m sure I don’t need to tell you who that is – are set for October 6th, with all the songs (allegedly) available to listen to/trash online. From what I’ve heard so far I don’t know if I’ll have the strength to carry on and listen to them all, since there’s only so much squeaky bubblegum pop a girl can take. Sometimes you just want to hear something more original. Speaking of which, since my last news roundup Ukraine have chosen something very strange original – at least by JESC standards. We all know there are two types of music dominating global charts at the moment: dance and dubstep. Russia have gone for dance with Lerika’s Junior entry, perhaps hoping that the Euphoria euphoria won’t have worn off by December and the voters will lap up another club anthem, even though Lerika won’t be crab-dancing during her performance (I’m guessing). But Ukraine…well, they weren’t satisfied with any old up-tempo fluff. 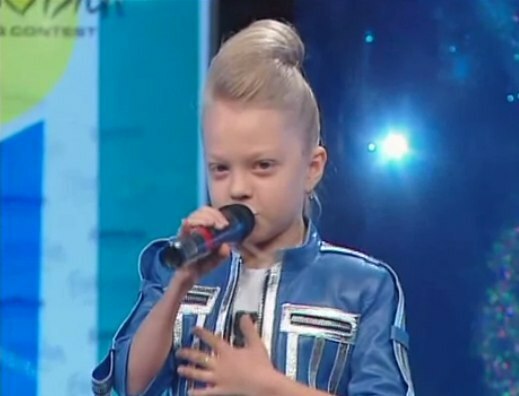 Instead, they went for a slightly scary dubstep number called Nebo, to be performed by the teeny-weeny Anastasiya Petryk, the younger sister of Victoria Petryk (Ukraine 2008). I don’t want to say much about this entry, what with wanting to have something left for my proper reviews later, but I will say don’t get me wrong. It may sound like I hate this, but that’s not the case. Anyway, the host city may be old news, but I’m only just beginning to see it as part of the EBU’s evil/sensible plan to downsize Eurovision. Malmö is a city of just over 300 000 people – according to Wikipedia, so give or take a few hundred thousand – and the Malmö Arena can seat about 15 500, which is perfectly adequate until you compare it to the stats of this year’s contest in Baku. There the population is a smidge over 2 million, and the brand spanking new Crystal Hall seats 23 000. I don’t honestly have a problem with curbing the contest – I mean, 15 500 is still a lot of people, and still requires plentiful toilet facilities – as long as countries are still being encouraged to debut or return to increase the show size in terms of competitors. Speaking of competitors, there are currently 25 lined up for next year’s contest: Albania, Armenia, Austria, Belarus, Bulgaria, Croatia, Denmark, Estonia, Finland, France, Germany, Hungary, Iceland, Ireland, Israel, Lithuania, the Netherlands, Norway, Romania, Serbia, Slovenia, Spain, Sweden, Switzerland and the United Kingdom. That means we can relax knowing there’ll be at least one semi final, even if all twenty or so still-TBC countries decide to boycott. For Andorra it’s a definite no, but still on tentative ground at the moment are the Czech Republic, Liechtenstein, Poland, Cyprus and Turkey. Turkey are apparently fed up with bloc voting, which I think is a bit rich coming from a country that often benefits from it. According to TRT’s head honcho, Sweden had won before this year’s delegations even bought their tickets to Baku, which means the contest wasn’t actually a contest, and I have to agree. I mean, it’s not like Loreen had a brilliant song and a groundbreaking stage show prepared or anything. And she did only win because she got a ton of points from such friendly neighbours as Hungary, Romania and Slovakia. The proof’s not in the pudding. It’s in the points. You’ve probably never heard of Vapenbröder, Clara Klingenström, Adam Sagström, Tezza Ericsson, Calle Nilsson, Therese Fredenwall, Elvira Fisk or Chris Michols, but today one of them will be announced as both the Svensktoppen Nästa (Swedish Chart’s Next) competition winner AND the first known contestant for Melodifestivalen 2013. They’re all competing in the radio contest, which began in 2008, with original songs that you can listen to here: http://sverigesradio.se/sida/artikel.aspx?programid=3147&artikel=5226407. I was majorly excited to hear them until I remembered the golden ESC rule – only songs aired from September 1st are eligible, meaning whoever wins Nästa will have a different song for Melodifestivalen. Still, the current songs are worth a listen because they could be an indication of what will end up at Sweden’s epic national final. Based on them, my personal favourite is Therese, but ultimately, as long as nobody likely to bring clichéd soft-rock or depressing ballads to MF (i.e. Calle or Chris) wins I’ll be looking forward to what they’ll offer us come February. That’s about all for today, folks. I hope you didn’t experience a news overload. I’d like to think if you did, you’d have stopped reading it a long time ago and wouldn’t be reading this, but one never knows. I seem to have slipped back into my pompous ways. That’s a cue to leave if ever there was one. COMING UP: another Time-Warp Tuesday and a rather random top 10. Posted on August 26, 2012, in Eurovision 2013, Junior Eurovision and tagged Anastasiya Petryk, ESC, Eurovision 2013, JESC, Junior Eurovision 2012, Lerika, Malmo, participants, Svensktoppen Nasta, TRT, withdrawals. Bookmark the permalink. 14 Comments. Yay! News! I haven’t been a huge fan of JESC, but it’s fun. Even though it’s been a month, I still am a bit shocked at the choice. However, what’s done is done. As for Malmö, we can’t forget that it’s joined with Copenhagen and their metro area, at least according to Wikipedia, consists of 3.8 million people. However, I do like the idea of a smaller Eurovision. The idea of Turkey, the country that sent a belly dancer in 2009 and placed fourth, withdrawing because of block voting is absolutely hilarious. Hypocrites, hypocrites, hypocrites. I’m still pulling for a Liechtensteiner début and a Czech return, though! No, it never is too early to talk Melodifestivalen. The released songs of the Svensktoppen Nästa remind me of a British duo that said they wanted to go to Eurovision and announced that… by releasing their prospective song… in July. It’s sad, though. It was good. Also, have you heard about the ABU’s Radio Song Contest? They’ve been talking about it for about two years, but this is the first glimpse of life. Eurovision Times got a list of all the songs, just in case you didn’t hear. Yay! News! I’m not the biggest fan of JESC, but it’s fun. As for Malmö, even one month along, I’m still a bit shocked. But, what’s done is done. Also, we must not forget that the Öresund Region, which consists of Copenhagen and Malmö, consists of 3.8 million people. However, I do enjoy the idea of a smaller Eurovision. Honestly, the idea of Turkey, the country that sent a freaking tone deaf belly dancer in 2009 and came fourth, withdrawing because of block voting is flipping hilarious. Hypocrites, hypocrites, hypocrites. I’m still holding out for a Liechtensteiner début and/or Czech return, though! Also, is your “Turkish” view of Sweden a really subtle joke based on the Ukranian flag consisting solely of blue and yellow like Sweden’s? If so, well done. By the way, have you heard about the ABU Radio Song Contest? Eurovision Times made a nice list of all the songs and I have to say, I really dig the Australian entry. Here’s the list. This is the third time I’ve tried to post this comment, and I’m very tired, so please excuse any typos or confusing statements. Yay! News! Even though I’m not a huge JESC fan, it’s fun to follow. However, it might be replaced by something almost totally unrealated to Eurovision… But more on that later. Even though it’s been a month, I still am sort-of mourning the loss of Stockholm as host. However, what’s done is done and I think Malmö will play host to a fantastic show. However, I feel like I have to mention that the region surrounding Malmö is home to 3.8 million people, which would make it larger than Baku. Talking of Baku, I can’t wait to see a smaller Eurovision, especially after the ridiculous over-spectacle that Baku created. I’m still holding out for a Liechtensteiner début and/or a Czech return, personally! Poland have no reason not to return and I think that they will. And I can’t forget Turkey. It’s freaking Bill Gates rich for them to complain about block voting, especially after sending that tone deaf belly dancer who placed fourth in 2009. Also, is your “Turkish” description of Sweden a subtle joke based on the fact that Ukraine, which is the only country to border Hungary, Romania and Slovakia, shares, in their flag, the same blue and yellow as Sweden? If so, than great job! Oh I just LOVE Melodifestivalen talk. The winner of Svensktoppen Nästa will remind me of a British duo that announced their candidacy for Eurovision to the public and the BBC by releasing their prospective song. I don’t have the time (or conciousness) to listen to all the tracks now, but I might in due time. In my dream world, Sweden would be represented by Icona Pop. Now that would make my year. Remember that JESC replacement? It would be the ABU Radio Song Contest, which, after two years of talks, will finally be coming to fruition with 13 countries, including Australia, sending 15 songs (Malaysia and South Korea have sent two). Most of the songs are sort of dull, but I think that the standouts are Australia, Vanuatu (my favorite), Bhutan and Fiji. Eurovision Times actually published a list of the songs. Here it is. This is the fourth time I’ve tried to post this. I’m nearly asleep while typing so I’ll just say two things. 1) With your “Turkish” description of Sweden, are you trying to make a subtle nod to Ukraine, which is the only country to border Slovakia, Romania and Hungary, having the same blue and yellow in their flag as Sweden? If so, very nice! 2) Did you hear about the ABU Radio Song Contest? It’s the result of two years of talks by the ABU and has 15 songs from 13 countries (including Australia, which has my second favorite song!). The Eurovision Times has a full list, which I sadly can’t post the link to, as I think that’s what’s screwing up my comment. 1) I wish I was that clever! I was just trying to make the point that the TRT guy’s complaints about Sweden winning because of block voting are totally unfounded. I don’t think he’s aware that Loreen broke Rybak’s record of the most douze points ever recieved, and amazingly not all of them were from other Scandinavian countries…I heard someone say today that if he thinks the contest is so predictable, he should tell us now who’ll be in the top 10 next year. I would very much like to see him do that! 2) Yes!! I’m kind of excited by this, since it’s the closest thing to the planned-then-abandoned Asiavision we’re gonna get. I haven’t had time to listen to them all yet, but I’m a big A-pop fan so I have big expectations. I wasn’t that fussed with the Australian entry, but I still want us to win! Which one’s your favourite? BTW, I’ve just seen that all your attempted comments went into my spam queue. I still got to read them! Don’t know what was going on there. Aw. If I had known that all those failed comments would have gone to your spam bin, I would’ve tried only once! Sorry about that. I would LOVE to see him put his money where his mouth is. That is, once he takes off his ignorance glasses. I’d also like to see him explain how Iceland, Denmark and Norway finished in the bottom six and how Finland failed to qualify at all! It is the hated Scandinavian block, isn’t it? As for “Asiavision,” my favorite is Vanuatu. I love the laid back, beachy tone it gives off. Then Australia, then Bhutan. Which one’s your favorite? Yes, darn Scandinavia for triumphing across the board!! Er, I mean, at the bottom of the board, with the exception of Sweden. What is that guy on? RE: the ABUSC, I haven’t had a chance to listen to any of the others yet, but since you recommend them I’ll start with Vanuatu and Bhutan. And get back to you! I love how, now, everyone can see those three failed comments! It’s just perfect. I don’t know what that dude is on. However, it seems to be a moot point (at least according to Wikipedia) because Turkey has confirmed its participation. Enjoy! One fact to note is that most of the songs are classic-style ballads that have other style influences. P.S. Let me try the link one more time. Here it is. Ahaha, sorry about that. I probably shouldn’t have approved them. I just didn’t want them to be sitting there, the only legit comments in a sea of spam crap. So I have managed to listen to a few of the ABU songs, and so far I’m liking Indonesia and Iran. Random. I’ve also listened to Malaysia and Vanuatu, but those two just catapulted Australia up into my favourites at this point. Danielle Blakey is coincidentally on Australian X Factor as we speak, which I thought was weird. Woohoo, we almost won something that’s kind of like Eurovision!! Such an achievement. That’s got to make Danielle feel better at least since she got booted off The X Factor after home visits. I still haven’t heard the winner…or Brunei…or Bhutan which people seem to be miffed about not winning. But I am excited for the song festival which has also already happened, but it’s going to be broadcast here soon. Should be interesting. I’m still hoping for unexpected debuts/returns, but as they say “hope for the best but expect the worst” so…but I’m with you on wanting Serbia back! Turkey complaining about block voting? What’s next? Russia complaining about block voting? xD (as an Alex Sparrow fan I shouldn’t make that joke though). But to be honest I would expect Turkey to be fed up with everyone complaining about how they always do so well and stuff, they didn’t qualify in 2011 after all! And I don’t want Turkey out 😥 I can’t imagine esc without them. If we can’t have Katya for Moldova then hopefully we’ll get her for the ESC when she’s old enough. I really want a JESC kid to make it to big Eurovision. Apparently Azerbaijan are bidding for JESC in 2013, which makes me think they’re going to participate. Hopefully it’s true! I’m so happy Therese won SN. I just wish Drop The Fight WAS going to be her Melodifestivalen song, because I love it. It reminds me of Why Start A Fire, which was one of my favourites this year…but oh well.